"@Pimpburgh2015: @KatyTurNBC @realDonaldTrump just tweeted that you are a third rate reporter." That's only because I'm being nice! NBC and CBS both falsely reported that leading Republican presidential candidate Donald Trump “abruptly” ended his speech and left the stage after being repeatedly interrupted by Black Lives Matter protesters at a campaign rally in Raleigh, North Carolina on Friday night. The reports were flat-out lies. Video of Trump’s speech shows he ended the speech on his own accord. Other videos show Trump then mingled with the crowd afterward for several minutes shaking hands and signing autographs. Donald Trump speaks at a campaign rally in Raleigh, NC, December 4, 2015, image via Twitter. A total of about two dozen protesters–some protesting solo, others in groups–were forcibly removed from the rally by security as the protesters disrupted Trump ten times over the course of his 50:35 speech. Many of the protesters were Black Lives Matter supporters. Compilation video by NBC News of Trump protesters at Raleigh, NC campaign rally, December 4, 2015. A capacity crowd of 7,800 attended the rally held at the Dorton Arena. About one hundred more protesters gathered outside the arena. WRAL-TV reported the protesters “at times blocked gates at the event” trying to prevent Trump supporters from attending the rally. A protester reported on Twitter that state troopers started preventing them from blocking the entrances. That protester also claimed there were about forty protesters inside the arena. Now 10. Trump ends speech abruptly and leaves stage. Tur’s report was immediately picked up by MSNBC’s top-rated Rachel Maddow Show. Deb’s article was written with an opinion slant to embarrass Trump over his criticism of Democratic presidential candidate Sen. Bernie Sanders of Vermont for allowing Black Lives Matter protesters to take over his stage and microphone at a rally last summer. …”But it was Trump who ended the speech early, which was striking, given his comments at an August press conference about fellow presidential candidate, Vermont Sen. Bernie Sanders, who himself cut a rally short in Seattle as a result of Black Lives Matter protesters. Trump turned out to be wrong about the number of protesters he would end up dealing with Friday night but was dead right about the dishonest media. Video of Trump’s speech shows that after “the last question” (as stated by the Trump staffer with the crowd mic) from the crowd was posed at the 49:45 mark, Trump spent a minute answering. He then pivoted and went into his closing remarks. Trump then resumed his closing remarks with a profound observation on the groundswell in the country. Trump began his closing remarks before the last protest. He then spoke for thirty seconds after that final protester interruption. Trump built his closing statement to a crescendo and ended with several ‘thank yous’. There was nothing abrupt or forced about the end of the speech. And far from “leaving the stage” due to the protesters, Trump mingled with the audience after the speech. He spent several minutes shaking hands, signing autographs and posing for pictures with supporters as he has done at other rallies. According to the YouTube video, Trump spoke for about 50:35, putting the speech in the ballpark range of his other campaign speeches. Trump’s voice was weak and scratchy throughout the speech. NBC’s Tur also incorrectly reported the length of the speech, putting it at 49 minutes. NBC’s Ali Vitali also posted a report, to NBC, in which he too made it seem the protesters forced Trump to cut short his appearance. Scavino also posted a 4:06 Periscope video of Trump working the crowd to reinforce the point that he did not ‘abruptly’ leave the stage due to protesters. Scavino solely went after NBC. Apparently he was not aware of CBS telling the same false story. 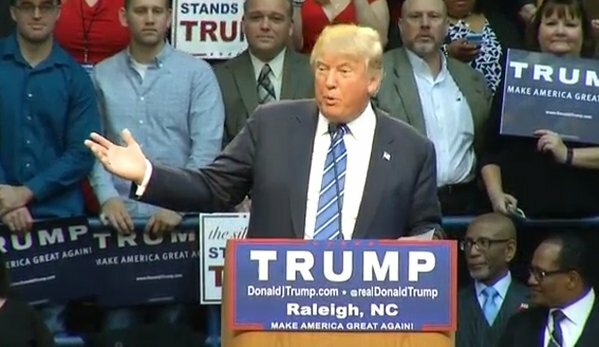 The fairest report on the Trump rally in Raleigh was written by Jeff Tiberii for WUNC-FM, a public radio station.